THE essential differences in the diets of the primitive races and those of the modernized groups have been discussed in the preceding chapter. We are concerned now with discovering whether the use of foods, which are equivalent in body-building and repairing material to those used by the primitives will, when provided to our affected modernized groups, prevent tooth decay or check it when it is active. There are two approaches to this problem of the control of tooth decay by nutritional means. One is by the presentation of clinical results and the other by the consideration of the characteristics of those nutritional programs which have been successful in producing a high immunity to tooth decay. We may divide the primitive racial stocks into groups, classified according to the physical environment in which they are living and the manner in which the environment largely controls their available foods. It is significant that I have as yet found no group that was building and maintaining good bodies exclusively on plant foods. A number of groups are endeavoring to do so with marked evidence of failure. The variety of animal foods available has varied widely in some groups, and been limited among others. In the preceding chapter we have seen that the successful dietaries included in addition to a liberal source of minerals, carbohydrates, fats, proteins, and water-soluble vitamins, a source of fat-soluble vitamins. Vitamin D is not found in plants, but must be sought in an animal food. The dietaries of the efficient primitive racial stocks may be divided into groups on this basis: in the first place those obtaining their fatsoluble activators, which include the known fat-soluble vitamins, from efficient dairy products. This includes the Swiss in the high Alps, the Arabs (using camel's milk), and the Asiatic races (using milk of sheep and musk ox). In the second place there are those using liberally the organs of animals, and the eggs of birds, wild and domesticated. These include the Indians of the far North, the buffalo hunting Plains Indians and the Andean tribes. In the third place there are those using liberally animal life of the sea. These include Pacific Islanders and coastal tribes throughout the world. In the fourth place there are those using small animals and insects. These include the Australian Aborigines in the interior, and the African tribes in the interior. The League of Nations' Committee on Nutrition has estimated the amount of pasture land required per capita to provide adequate milk and meat. Owing to the density of population and cost of land near large cities, it is not possible to provide an adequate acreage for dairy cattle. This results in stall feeding of shipped fodder. Only those cows can be kept in a herd whose production of milk and butter fat can pay in volume for their keep. Unfortunately milk may have a high cream line or butter fat content and still be low in essential fat-soluble vitamins. This constitutes an exceedingly important phase of our modern problem. Butter ships best when hard and this quality can be largely controlled by the fodder given to the cattle and hence becomes an important factor in the wholesale butter industry. Since 1927, I have been analyzing samples of dairy products, chiefly butter, from several parts of the world for their vitamin content. These samples are received every two to four weeks from the same places, usually for several years. They all show a seasonal rise and fall in vitamin content. The high level is always associated with the use of rapidly growing young plant food. This tide in plant life, fluctuating with the seasons, controlled the migration of the buffalo southward in the autumn and winter and northward in the spring. They moved at the rate of about twelve miles per day, travelling with the sun in order to provide the highest-vitamin milk for the young calves born in the south. No doubt these tides in nutrition control also the migration of birds. By far the most efficient plant food that I have found for producing the high-vitamin content in milk is rapidly growing young wheat and rye grass. Oat and barley grass are also excellent. In my clinical work small additions of this high-vitamin butter to otherwise satisfactory diets regularly checks tooth decay when active and at the same time improves vitality and general health. Similarly the value of eggs for providing fat-soluble vitamins depends directly upon the food eaten by the fowl. The fertility of the eggs also is a direct measure of the vitamin content, including vitamin E.
Since the sea foods are, as a group, so valuable a source of the fatsoluble activators, they have been found to be efficient throughout the world not only for controlling tooth decay, but for producing a human stock of high vitality. Unfortunately the cost of transportation in the fresh state often constitutes a factor limiting distribution. Many of the primitive races preserved the food value, including vitamins, very efficiently by drying the fish. While our modern system of canning prevents decomposition, it does not efficiently preserve some of the fatsoluble activators, particularly vitamin A. Since the organs, particularly the livers of animals, are storage depots of the vitamins an important source of some of the fat-soluble activators can be provided by extracting the fat of the livers and shipping it as liver oils. Modern methods of processing have greatly improved the quality of these oils. There are some factors, however, which can be provided to great advantage for humans from dairy products of high efficiency. I have shown in the preceding chapter the quantities of several of the minerals that are essential in suitable chemical form to maintain an adult in good health and make possible tissue repair. The dietaries of the various primitive groups have all been shown to have a mineral content several times higher than that which obtains in the inadequate food eaten by modernized primitives and the people of our modernized cultures. Modern commerce has deliberately robbed some of nature's foods of much of their body-building material while retaining the hunger satisfying energy factors. For example, in the production of refined white flour approximately eighty per cent or four-fifths of the phosphorus and calcium content are usually removed, together with the vitamins and minerals provided in the embryo or germ. The evidence indicates that a very important factor in the lowering of reproductive efficiency of womanhood is directly related to the removal of vitamin E in the processing of wheat. The germ of wheat is our most readily available source of that vitamin. Its role as a nutritive factor for the pituitary gland in the base of the brain, which largely controls growth and organ function, apparently is important in determining the production of mental types. Similarly the removal of vitamin B with the embryo of the wheat, together with its oxidation after processing, results in depletion of body-building activators. Refined white sugar carries only negligible traces of body-building and repairing material. It satisfies hunger by providing heat and energy besides having a pleasant flavor. The heat and energy producing factors in our food that are not burned up are usually stored as fat. In the preceding chapter we have seen that approximately half of the foods provided in our modern dietaries furnish little or no body-building or repairing material and supply no vitamins. Approximately 25 per cent of the heat and energy of the American people is supplied by sugar alone which goes far in thwarting Nature's orderly processes of life. This per capita use is unfortunately on the increase. Therefore we must begin by radically reducing the foods that are so deceptive, and often injurious in overloading the system. Even this much change in our modern nutrition will raise the factor of safety sufficiently to check tooth decay in a large percentage of people. It will not, however, be adequate for most children in whom the additional demands of rapid growth must be satisfied. I have found the highest incidence of tooth decay in the high school and boarding school girls, and the next in the boarding school boys. These groups suffer even more than the childbearing mothers. In discussing the technical aspects later I shall consider the defensive factors in the saliva as controlled by the nutrition through the blood stream, and also the role of oral prophylaxis. It is appropriate at this point to note some characteristics of a decaying tooth. The process of tooth decay never starts from within but always from without and is most likely to start at the contact points between the teeth or in the pits and grooves, especially when these are incompletely formed. Teeth never have caries while they are covered with flesh but decay most easily soon after eruption, when conditions are unfavorable. If the saliva is normal the surfaces of the teeth progressively harden during the first year after eruption. While there are many theories regarding the relative importance of different factors in the process of decay practically all provide for a local solution of the tooth substance by acids produced by bacteria. The essential difference in the various theories of tooth decay is the difference in theories relative to the control of these decalcifying organisms, and relative to their quantity and activity. The dental profession has been waiting for decades for this question to be solved before taking active steps to prevent the whole process. The primitive approach has been to provide a program that will keep the teeth well, that is, prevention of dental caries by adequate food combinations. I have just stated that teeth harden after eruption if the saliva is normal. This occurs by a process of mineralization much like the process by which petrified wood is produced. The tooth is made up of four structures. The first is the pulp within, which carries blood vessels and nerves. This structure is surrounded in both the root and crown by the dentine or tooth bone which is nourished from within. The dentine of the root is covered by cementum which receives nourishment from the membrane which attaches the root to the jaw bone. The dentine of the crown or exposed part of the tooth is covered with enamel. Tooth decay proceeds slowly through the enamel and often rapidly in the dentine, always following the minute channels toward the pulp, which may become infected before the decay actually reaches the pulp to expose it; nearly always the decay infects the pulp when it destroys the dentine covering it. When a tooth has a deep cavity of decay, the decalcified dentine has about the density of rotten wood. With an adequate improvement in nutrition, tooth decay will generally be checked provided two conditions are present: in the first place, there must be enough improvement in the quality of the saliva; and in the second, the saliva must have free access to the cavity. Of course, if the decay is removed and a filling placed in the cavity, the bacteria will be mechanically shut out. One of the most severe tests of a nutritional program, accordingly, is the test of its power to check tooth decay completely, even without fillings. There are, however, two further tests of the sufficiency of improvement of the chemical content of the saliva. If it has been sufficiently improved, bacterial growth will not only be inhibited, but the leathery decayed dentine will become mineralized from the saliva by a process similar to petrification. Note that this mineralized dentine is not vital, nor does it increase in volume and fill the cavity. When scraped with a steel instrument it frequently takes on a density like very hard wood and occasionally takes even a glassy surface. When such a tooth is placed in silver nitrate, the chemical does not penetrate this demineralized dentine, though it does rapidly penetrate the decayed dentine of a tooth extracted when decay is active. This process is illustrated in Fig. 96 which shows two deciduous teeth extracted from the same child, one before, and the other a few months after improving the nutrition. These deciduous molars were replaced by the bicuspids of the second dentition. The tooth at the left had deep caries and was removed before the treatment was begun. Note that the silver nitrate has blackened the tissue to the depth of the decay. 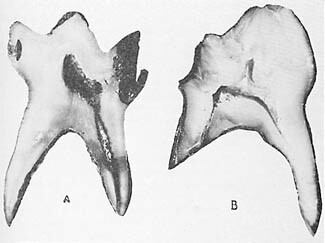 The tooth at the right was removed about three months after the nutrition was changed. Note that the decayed dentine is so dense that the silver nitrate has not penetrated deeply and discolored it. FIG. 96. A, illustrates the permeability of decayed dentin to silver nitrate. B, illustrates the decreased permeability of decayed dentin to silver nitrate due to mineralization, after saliva has been improved by correcting the nutrition. There is still another test that demonstrates Nature's protective mechanisms. Ordinarily, when the pulp of a tooth is exposed by dental caries, the pulp becomes not only infected, but dies opening up a highway of infection direct from the infected mouth to the inside of the fort at the end of the root. One expression of this is a dental abscess, the existence of which is usually unknown to the individual for sometime and the infecting germs pass more or less freely throughout the body by way of the blood stream and lymph channels. This infection may start the degeneration of organs and tissues of other parts of the body. Among some of the primitive races, whose nutritional programs provided a very high factor of safety, even though the teeth were worn down to the gum line and into what was formerly the pulp chamber, the pulp was not exposed. Nature had built a protecting zone, not in the cavity of the tooth in this case, but within the pulp chamber. This entirely blocked off a threatened exposure and kept the walls of the fort sealed against bacteria. This process does not occur in many instances in people of our modern civilization. Pulp chambers that are opened by wear provide exposed pulp which becomes infected with subsequent abscess formation. If a reinforced nutrition as efficient as that of many of the primitive races, is adopted, the pulp tissue will seal up the opening made by decalcification of the dentine, by building in a new layer of normal dentine which is vital and quite unlike the petrified decay exposed to the saliva, thus completely walling off the impending danger. This is illustrated in Fig. 97 with three cases. At the left are shown x-rays of teeth of three children in one of my experimental clinics in a poor district in Cleveland. The pulp chambers and pulp tissues of the root canals are shown as dark streaks in the center of the tooth. The very large cavities which had decalcified the tooth to the pulp chamber are shown as large dark areas in the crown. Temporary fillings had to be placed because of pain produced by the pressure of food on the pulp below the decayed dentine. After the nutrition was improved, the tissues of the pulp built in secondary dentine thus reincasing itself in a closed chamber. This process is shown in each of the three cases presented in Fig. 97, in the views to the right. FIG. 97. Three cases that illustrate how nature can close an exposure of the pulp due to dental caries by building a protecting wall within the pulp chamber when the nutrition is adequately improved. Under the stress of the industrial depression the family dietary of the children shown in Fig. 97 was very deficient. They were brought to a mission where we fed them one reinforced meal at noon for six days a week. The home meals were not changed nor the home care of the teeth. The preliminary studies of each child included complete x-rays of all of the teeth, a chemical analysis of the saliva, a careful plotting of the position, size and depth of all cavities, a record of the height, and weight, and a record of school grades, including grades in deportment. These checks were repeated every four to six weeks for the period of the test, usually three to five months. It is important to note that the home nutrition which had been responsible for the tooth decay was exceedingly low in body building and repairing material, while temporarily satisfying the appetite. It usually consisted of highly sweetened strong coffee and white bread, vegetable fat, pancakes made of white flour and eaten with syrup, and doughnuts fried in vegetable fat. The nutrition provided these children in this one meal included the following foods. About four ounces of tomato juice or orange juice and a teaspoonful of a mixture of equal parts of a very high vitamin natural cod liver oil and an especially high vitamin butter was given at the beginning of the meal. They then received a bowl containing approximately a pint of a very rich vegetable and meat stew, made largely from bone marrow and fine cuts of tender meat: the meat was usually broiled separately to retain its juice and then chopped very fine and added to the bone marrow meat soup which always contained finely chopped vegetables and plenty of very yellow carrots; for the next course they had cooked fruit, with very little sweetening, and rolls made from freshly ground whole wheat, which were spread with the high-vitamin butter. The wheat for the rolls was ground fresh every day in a motor driven coffee mill. Each child was also given two glasses of fresh whole milk. The menu was varied from day to day by substituting for the meat stew, fish chowder or organs of animals. From time to time, there was placed in a two quart jar a helping similar to that eaten by the children. This was brought to my laboratory for chemical analysis, which analysis showed that these meals provided approximately 1.48 grams of calcium and 1.28 grams of phosphorus in a single helping of each course. Since many of the children doubled up on the course, their intake of these minerals was much higher. I have shown in the preceding chapter that the accepted figures for the requirements of the body for calcium and phosphorus are 0.68 grams of calcium and 1.32 grams of phosphorus. It is obvious that this one meal a day plus the other two meals at home provided a real factor of safety. Clinically this program completely controlled the dental caries of each member of the group. The chemical analysis of the saliva (1, 2) revealed a marked improvement which progressively increased. At the beginning of the test the average for the group showed a very low factor of safety, so low that we should expect tooth decay to be active. In six weeks the average changed to a condition which we should expect would be accompanied by a cessation of tooth decay. The saliva factor of safety continued to improve for five months at which time the special program was discontinued for the summer. I have referred to the importance of a high vitamin butter for providing the fat-soluble activators to make possible the utilization of the minerals in the foods. In this connection, it is of interest that butter constitutes the principal source of these essential factors for many primitive groups throughout the world. In the high mountain and plateau district in northern India, and in Tibet, the inhabitants depend largely upon butter made from the milk of the musk ox and the sheep for these activators. The butter is eaten mixed with roasted cereals, is used in tea, and in a porridge made of tea, butter and roasted grains. In Sudan Egypt, I found considerable traffic in high vitamin butter which came from the higher lands a few miles from the Nile Basin. This was being exchanged for and used with varieties of millet grown in other districts. This butter, at the temperature of that area, which ranged from 90° to 110° Fahrenheit, was, of course, always in liquid form. Its brilliant orange color testified to the splendid pasture of the dairy animals. The people in Sudan, including the Arabs, had exceptionally fine teeth with exceedingly little tooth decay (Chapter 9). The most physically perfect people in northern India are probably the Pathans who live on dairy products largely in the form of soured curd, together with wheat and vegetables. The people are very tall and are free of tooth decay. Probably every housewife is familiar with the low melting quality of the butter produced in early summer when the cows have been put on the green pastures. This is particularly true of butter that has the grassy flavor and the deep yellow to orange color. This butter is usually several times as high in fat-soluble activators including vitamins A and D as butter produced from stall fed cattle or cattle on poorer pasturage. In Chapter 15, I have explained why this butter is not favorable for shipping and why dairymen so frequently give the cows a ration that will produce less of these qualities. One of the principal foods used for accomplishing this is made of cotton seed meal and cereals. With reference to the cattle from the south-western and central-northern states of the drought area which were brought into Ohio in the fall of 1935 on a 600 acre farm north of Delaware, will say that I had the privilege of viewing some of these cattle previous to the time that they were brought to Ohio in 1935. Because of the extreme drought period and the hot sun, it was rare to see green grass on the prairies. The sedges were nearly all dried up. The tumbleweed was about the only thing that was available for the cattle in some instances. The corn was dried up and very little green was in evidence. In the particular location that I was in we found the cattle suffering terribly. Many had infected eyes. There were a good many deaths on the plains which were literally dried up. Sometimes there was even a small amount of decomposition after death. In the fall, those that survived on the plains, were loaded up and driven to the corrals, loaded into cars and sent east. Only the good ones were loaded and even a large number of these passed out in transit. I was informed that the crop of grass the year before was very scant. Consequently, a large number of calves were born with weak eyes and these were the early ones to pass out on the plains. The low vitality of the individuals which I considered was due to the lack of vitamin A or the green grass factors was the cause of the serious infection, however their being secondary to the primary cause. The first train load of the twenty-eight hundred cattle that were brought to this ranch were fed on green corn stalks. There was a nine acre patch of corn in this area. The fences were taken down one afternoon at 3 o'clock and by 9 o'clock there was no evidence of stubbles or roots. This had all been eaten in a very short space of time. We had quite a time getting hays and green stuff which we demanded because of its carotin content and its green grass factor. There was not enough grass available in the beginning so we had to buy about 400 tons of hay a day to keep the animals fed. They got no grain of any kind because it was a question of bringing the cattle to a more or less normal condition with no intention of fattening the animals. After they had made arrangements for feeding operations and made feed racks in sufficient numbers, we went over the herd to estimate the numbers that were blind and had sore eyes, which I assume from past experience, was due to a vitamin A deficiency. As near as we can estimate, nearly 8 12 animals were affected (29 per cent). There were 157 calves born and approximately 50 per cent were deformed and not normal. We did not get the complete figures but they probably ranged a little higher than that. The worst infected cows were calves and animals that were 18 to 20 months old. I could not get the story of these individuals but they must have been in the area of dry grass for 2 years. There was a slight improvement in those that were not seriously infected after they were fed here. They improved decidedly in October and November and were practically all slaughtered before the middle of December. The milk of these vitamin deficient cows would not properly nourish either their calves or human beings. Many children have tooth decay even while using whole milk, in part because the milk is too low in vitamin content, due to the inadequacy of the food given the cows. The means for improving this condition have been discussed in Chapter 15. Some of the current theories of the chemistry of tooth decay place the responsibility on the local condition in the mouth as affected by the contributing factors provided by sugars and starches which enhance the growth of acid producing organisms. A phase of this has been closely related to the slogan that a clean tooth cannot decay. Among the difficulties in applying this interpretation is the physical impossibility of keeping teeth bacteriologically clean in the environment of the mouth. Another difficulty is the fact that many primitive races have their teeth smeared with starchy foods almost constantly and make no effort whatsoever to clean their teeth. In spite of this they have no tooth decay. In many of the primitive groups that I have studied the process of modernization includes teaching oral hygiene and prophylaxis. Yet, even with the addition of this important adjunct to health, they have in most cases lost their immunity to tooth decay and dental caries has become active. This will be seen in many of the illustrations of the primitive races in the preceding chapters. Of course everyone should clean his teeth, even the primitives, in the interest of and out of consideration for others. In my clinical work I have sought for extreme cases of active tooth decay in order to test the primitive wisdom. Many of these cases have been furnished by members of the dental profession in other cities and states. By the simple procedure of studying the nutrition of the individual, obtaining a sample of saliva for analysis, seeing x-rays of the individual's teeth and supporting bone, and getting a history of the systemic overloads, I have been able to outline a nutritional program which, in well above 90 per cent of the cases has controlled the dental caries. Improvement in the condition of the teeth has been confirmed by later x-rays and reports by the patients' dentists. In a few cases where I had contact with the patients only through correspondence the cooperation was not adequate for accomplishing complete improvement. While it is true that there is a marked difference in the susceptibility of different individuals to dental caries, even those who would ordinarily be classed as highly susceptible, have generally received permanent benefit from the treatment. These principles of treatment have now been applied to many hundreds of patients as indicated by the fact that over 2,800 chemical analyses of the saliva have been made. The dietary programs that have been recommended have been determined on the basis of a study of the nutrition used by the patient, the data provided by the x-rays, from the saliva analysis and case history. The diets have been found to be deficient in minerals, chiefly phosphorus. Fat-soluble vitamins have been deficient in practically every case of active tooth decay. The foods selected for reinforcing the deficient nutritions have always included additional fatsoluble vitamins and a liberal source of minerals in the form of natural food. Human beings cannot absorb minerals satisfactorily from inorganic chemicals. Great harm is done, in my judgment, by the sale and use of substitutes for natural foods. One of our greatest difficulties in undertaking to apply the wisdom of the primitives to our modern problems involves a character factor. The Indians of the high Andes were willing to go hundreds of miles to the sea to get kelp and fish eggs for the use of their people. Yet many of our modern people are unwilling to take sufficient trouble to obtain foods that are competent to accomplish the desired results. Jobbers and middlemen as well as supply depot managers want butter sold in accordance with its label rather than in accordance with its vitamin content. One large distributor whom I asked to cooperate by maintaining a stock of high-vitamin butter to which I could refer people, told me frankly that he wished I would stop telling people about the difference in the vitamins in butter. He did not wish them to think of butter in terms of its vitamin content. Another large concern told me that when I had worked up a sufficiently large market they would become interested in supplying the demand. I counsel people to put in storage some of that butter which has the grassy flavor and which melts easily and is produced when the cows go onto the rapidly growing young grass. Unfortunately, cows that have been on a stable fodder low in carotene and under the stress of gestation often are so depleted in their own body vitamins that it takes them three or four weeks to replenish their own bodies when they get on good pasture. Then the vitamins will appear in liberal quantity in their milk. This has made it necessary for me to assist many patients in obtaining a supply by analyzing butter for its vitamin content and then putting this material in storage and making it available for special cases as needed. The program that I have found most efficient has been one which includes the use of small quantities of very high vitamin butter mixed in equal parts with a very high vitamin cod liver oil. A simple method of preparing the butter is by melting it and allowing it to cool for twenty-four hours at a temperature of about 70° F., then centrifugalizing it which provides an oil that remains liquid at room temperature. When this butter oil is mixed in equal parts with a very high-vitamin cod liver oil, it produces a product that is more efficient than either alone. It should be used within a couple of weeks of the time it is mixed. It is desirable that this material be made available in various parts of the country. Even the high-vitamin butter produced on the early summer growth of grass put in storage and used during the winter will go far toward solving our great national problem of shortage of fat-soluble vitamins. The quantity of the mixture of butter oil and cod liver oil required is quite small, half a teaspoonful three times a day with meals is sufficient to control wide-spread tooth decay when used with a diet that is low in sugar and starches and high in foods providing the minerals, particularly phosphorus. A teaspoonful a day divided between two or three meals is usually adequate to prevent dental caries and maintain a high immunity; it will also maintain freedom from colds and a high level of health in general. This reinforcement of the fat-soluble vitamins to a menu that is low in starches and sugars, together with the use of bread and cereal grains freshly ground to retain the full content of the embryo or germ, and with milk for growing children and for many adults, and the liberal use of sea foods and organs of animals, produced the result described. I have previously reported (3) seventeen cases of extensive dental caries. In these patients there were found 237 open cavities of apparently active caries. Most of the individuals were between twelve and twenty years of age and accordingly had twenty-eight permanent teeth each, or a total of 476. It will be noted that if one cavity is allowed per tooth, approximately half of the total number of teeth were affected, or precisely 49.7 per cent of all the teeth had open cavities. This group includes only persons of whom I have been making critical examination every six to twelve months over a three-year period. 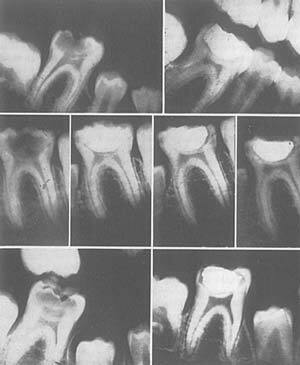 In practically all cases, Roentgen-ray examinations were made in addition to clinical examinations of the teeth. While these persons have been on the reinforced nutritional program during the winter and spring months of the past three years, only two new cavities have developed in the group, or 0.4 per cent. The length of time during which the cavities previously found had been developing is not known beyond the fact that all of the patients were receiving frequent and thorough dental service, most of them twice a year and many of them more frequently. It is accordingly probable that the cavities found had developed in less than a year. That dental caries was not a new problem with these persons was indicated by the very extensive and numerous dental restorations that had been made in their mouths. It is, therefore, apparent that 250 times as many cavities developed in the period preceding the starting of the nutritional program as in the three years following its adoption. If these data were reduced to a yearly basis, the comparison would show a much wider variation. In a group of fifty persons, including the above mentioned seventeen, who had been on the special nutritional program for from one to six years, most of them three years or more, only two new cavities developed. Allowing these persons to have an average of twenty-eight teeth per person, or a total of 1,400 teeth, this would represent an incidence of dental caries in a period of three years of 0.14 per cent. In this group of fifty, there are many instructive and striking cases. For example, H. F. did not have a single cavity from October, 1932, to June, 1933, while taking additional vitamins and high mineral foods. From June, 1933, to May, 1934, while not taking the special vitamins, she developed ten new cavities. S. K., prior to 1931 had rampant tooth decay with pulps nearly exposed in all first permanent molars. The remaining deciduous teeth had been reduced to shells. She was on the special nutritional program from December, 1931, to June, 1932, during which time caries was completely arrested. She discontinued taking special oil in June, 1932, and did not take it again until October, 1933, during most of which time she was taking viosterol under a physician's prescription to prevent dental caries. She came in October, 1933, with fourteen new cavities. She was immediately placed again on the special program, from October, 1933, to May, 1934. During this period, the dental caries was completely under control. During the time that she was not on the special program, there developed on many of the surfaces of the permanent teeth white patches of decalcifying enamel. Under the reinforced nutritional program, these largely disappeared, and those that did not regain their translucency turned dark. Among the group of seventeen J. H., sent in from another city, had thirty-eight open cavities in June, 193 1. In addition to active caries, he had quite disturbing heart symptoms, which curtailed his activity, and he also had a marked sense of lassitude and weariness. He has been on the reinforced nutritional program during the fall, winter and spring of each year since that time. During this time, he has not developed a single new cavity. The density of all the teeth has progressively improved as evidenced by Roentgen-ray records. His physical condition has been greatly improved so that he is able to carry on his college activities and heavy outside work to earn money to maintain his college expenses. He is not conscious of a heart limitation. When asked what the principal change was that he had noticed, he said that in addition to not feeling tired, he was more rested with six hours' sleep than formerly with ten hours'. A. W. had thirty-two new cavities in the two years previous to beginning the special nutritional reinforcement. She continued this regularly during the winter and spring months for three years and has not had a single new cavity since that time. In a group of children whose mothers had the special nutritional reinforcement during gestation and lactation and who had been provided with the same dietary adjuncts during the winter and spring months of infancy and early childhood, not a single carious cavity has developed. A number of these children are now in public schools. Their physical development is distinctly above that of the average children of their age, as is also their efficiency in school work. I am frequently reminded that ancient skulls are often found with extensive dental caries thus disproving that the primitive groups were more free from dental caries than the modern groups. It must be kept in mind that the fundamental laws of Nature have been in operation as long as animals and men have been on the earth. In my investigations among primitive races, I have been concerned particularly with the study of changes that have taken place both in immunity to dental caries and in the environment, including the foods used. It has been important that I find large groups with relatively high immunity to dental caries to be used as controls. There is great need, accordingly, that additional data be provided. Fortunately, this need is being met. There have just come to my desk two interesting reports; one, from Dr. Arne Hoygaard (7) and the other from Dr. P. O. Pedersen. (8) These two distinguished scientists have spent a year in East Greenland among the Eskimos in that very barren and isolated region. The percentage of teeth found attacked by dental caries among the isolated Eskimos of East Greenland is exceedingly low, less than 1 per cent. Where the Eskimos were in contact with modernized store foods at the port, tooth decay was active. The conditions which they have found were apparently not quite so favorable as in the groups I studied in Alaska. The Greenland Eskimos apparently are living in a more difficult environment. The data provided by these investigations are in accord with the data I have obtained among isolated Eskimos and other primitive racial stocks. Eastern Greenland, by international agreement, is administered by the Danish Government and no one is permitted even to visit the coast of Greenland without special permission. This permission is very difficult to obtain. Even Danish citizens are not free to travel there. We are, accordingly, very grateful to Dr. Hoygaard and Dr. Pedersen for their contribution from studies made in that protected field. We shall look forward with interest to their detailed reports. Unfortunately, the public is very much at sea because of the extravagant claims that are made for many of the products advertised over the radio, in journals, and by door to door solicitation. A dependable and helpful booklet on the vitamin content of foods has been published by the United States Department of Agriculture, Miscellaneous Publications, No. 275. The fact should always be emphasized that foods as Nature makes them have much more nutritional value than after they are processed so that insect life cannot live on them. When foods cannot support insect life they cannot support human life. A report has just appeared in the September number of the New Zealand Dental Journal by H. H. Tocker on behalf of the Hawkes Bay Branch of the New Zealand Dental Association in which he reports the results of the application of my suggestions in the Hukarere School for native Maori girls at Napier. I have reported my studies there in Chapter 12. They used only one part of my suggestions for checking the activity of dental caries. The diet of both their control group and tested group was the same except for one item, i.e., "one heaped teaspoonful twice daily of malt and cod liver oil." In a group of sixty-six native girls the thirty-three with the best teeth were used as a control group. The remaining thirty-three were given the additional fat-soluble vitamins. In six months' time ~resistance of this group was raised by 41.75 per cent" as compared with the control group. The nutrition of the test group was not adequately reinforced to obtain the best results. There was a marked inadequacy of mineral carrying foods in proportion to the energy and heat providing factors in the foods. An adequate quantity of such efficient foods should be as readily available today as before the white men came to New Zealand. It is important to summarize at this point some of the data that I have developed in other chapters because of their direct relation to the control of dental caries and other degenerative processes. Since human life like other animal life has been developed in Nature's laboratory to fit Nature's natural foods we run a great risk when we undertake to modify seriously these foods. Bakers' so-called whole wheat bread is not comparable to Nature's foods that provide entire wheat and other cereals, because of the factors that have been removed from the wheat either mechanically or by oxidation. This is so large a problem that adequate changes in the available grain foods cannot be made until there 15 sufficient public demand to produce them through the normal channels of supply and demand. It is primarily a problem for our Federal and State governments. Packaged foods containing dry cereals can undergo important changes, even while the material is being processed or while in packages on the shelves. The determinations of the loss of vitamins in packaged foods as reported in 1938 by the Agricultural Experimental Station of Oklahoma Agricultural and Mechanical College, reveal that a material loss occurs in two weeks' time and a very serious loss in one to two months' time in certain stock rations. An important source of misapprehension is the literature and teachings of fadists. Such, for example, as the misapprehension of many people that they must use only alkaline producing foods and that a great danger is associated with the use of acid producing foods. In the primitive races I have found practically no difference between the acid balance meat diet of the isolated Eskimos of the far north and the less acid vegetable and milk diet of other groups as efficient factors in control of caries. It is important to keep in mind that our bodies have a mechanism for maintaining proper acid and alkali balance in the blood and this varies through only a very narrow limit whether the balance of the total food eaten is acid or alkaline. It is also important to have in mind that there are certain fat-soluble vitamins provided in dairy products in adequate quantity that cannot all be supplied in fish oils. Also that overdosing with cod liver oil and other fish oils can be definitely detrimental. When packages of cod liver oil are purchased from the trade the material should be received in full containers not exposed to air and when opened should be transferred to small units so it is not progressively oxidized during the period of its use. The excess of calories over body building minerals is exceedingly high in sweets of various kinds regardless of their special branding and the methods of manufacture and storage. There is very little of the body building minerals in maple syrup, cane syrup from sugar or honey. They can all defeat an otherwise efficient dietary. The problem is not so simple as merely cutting down or eliminating sugars and white flour though this is exceedingly important. It is also necessary that adequate mineral and vitamin carrying foods be made available. It is also necessary to realize that many of our important foods for providing vitamins are very low in body building material. For example, one would have to eat nearly a bushel of apples a day or half a bushel of oranges to obtain a liberal factor of safety for providing phosphorus; similarly one would be required to eat nine and one half pounds of carrots or eleven pounds of beets each day to get enough phosphorus for a liberal factor of safety, while this quantity would be provided in one pound of lentils or beans, wheat or oats. I have discussed elsewhere the availability of phosphorus depending upon its chemical form. Since the calories largely determine the satisfying of the appetite and since under ordinary circumstances we stop when we have obtained about two thousand to twenty-five hundred very little of the highly sweetened fruits defeats our nutritional program. We would have to consume daily the contents of thirty-two one pound jars of marmalade, jellies or jams to provide a two gram intake of phosphorus. This quantity would provide 32,500 calories; an amount impossible for the system to take care of. Milk is one of the best foods for providing minerals but it may be inadequate in several vitamins. Of all of the primitive groups studied those using sea foods abundantly appear to obtain an adequate quantity of minerals particularly phosphorus with the greatest ease, in part because the fat-soluble vitamins provided in the sea foods (by which I mean animal life of the sea) are usually high. This enables a more efficient utilization of the minerals, calcium and phosphorus. As I study routinely the sample dietaries being used by people suffering from dental caries, usually associated with other disturbances, I find large numbers who are not getting in their food even half the minimum requirements of calcium, phosphorus and magnesium and iron and usually only a fraction of the minimum requirements of the fat-soluble vitamins. These latter have a role which in many respects is like the battery of an automobile which provides the spark for igniting the fuel. Even though the tank is filled with gasoline there is no power without the igniting spark. There are two programs now available for meeting the dental caries problem. One is to know first in detail all the physical and chemical factors involved and then proceed. The other is to know how to prevent the disease as the primitives have shown and then proceed. The former is largely the practice of the moderns. The latter is the program suggested by these investigations. Available data indicate that the blood and saliva normally carry defensive factors which when present control the growth of the acid producing organisms and the local reactions at tooth surfaces. When these defensive factors are not present the acid producing organisms multiply and produce an acid which dissolves tooth structure. The origin of this protective factor is provided in nutrition and is directly related to the mineral content of the foods and to known and unknown vitamins particularly the fat-soluble. Clinical data demonstrate that by following the program outlined dental caries can be prevented or controlled when active in practically all individuals. This does not require either permission or prescription but it is the inherent right of every individual. A properly balanced diet is good for the entire body. TISDALL, F. F. and KRAMER, B. Methods for the direct quantitative determination of sodium, potassium, calcium, and magnesium. J. Biol. Chem., 48:1, 1921. KUTTNER, T. and COHEN, H. Micro colorimetric studies. I. A molybdic acid, stannous chloride reagent. J. Biol. Chem., 75: 517, 1927. PRICE, W. A. Eskimo and Indian field studies in Alaska and Canada. J. Am. Dent. A., 23:417, 1936. PRICE, W. A. Control of dental caries and some associated degenerative processes through reinforcement of the diet with special activators. J. Am. Dent. A., 19:1339, 1932. MATTILL, H. A. The oxidative destruction of vitamins A and E. J.A.M.A., 89:1505, 1927. LEASE, E. J., et al. Destruction of vitamin A by rancid fats. J. Nutrition, 16:571, 1938. HOYGAARD, A. Some investigations into the physiology and nasology of Eskimos from Angmagsslik in Greenland. Oslo, Dybwad, 1937. PEDERSEN, P. O. Investigations into dental conditions of about 3000 ancient and modern Greenlanders. Dent. Rec., 58:191, 1938.